The Spanish banking system is in far worse shape than most realize because of unrealized losses related to Spain's imploded housing bubble. Various austerity measures and tax hikes to bail out French and German banks will greatly exacerbate this problem. Spanish home prices fell for the 14th consecutive quarter as unemployment surged and a drop in mortgage lending crimped demand for property. The average price of houses and apartments dropped 7.4 percent in three months ended Sept. 30 from the same period a year earlier, according to the National Statistics Institute in Madrid. Repossessed houses in Spain are worth 43 percent less on average than the valuations assigned on the mortgages for the properties, according to Fitch Ratings. Price declines range from 20 percent to 58 percent, analysts Juan David Garcia and Carlos Masip in Madrid wrote in a report analyzing 8,235 properties funded by loans from banks including Banco Santander SA (SAN) and Bankia SA. The mortgages are in asset-backed securities with high loan-to-value ratios. 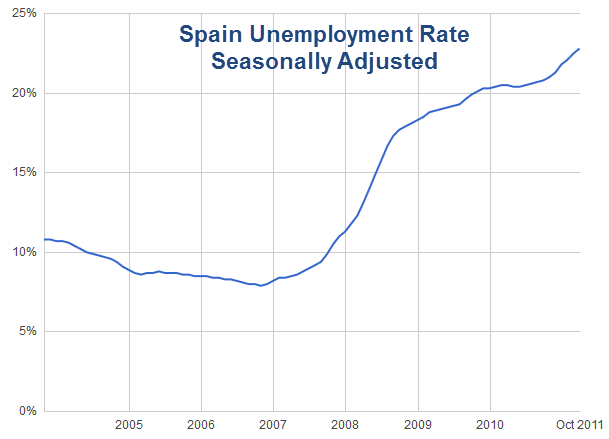 Spain's Unemployment Rate is 22.8% and rising. 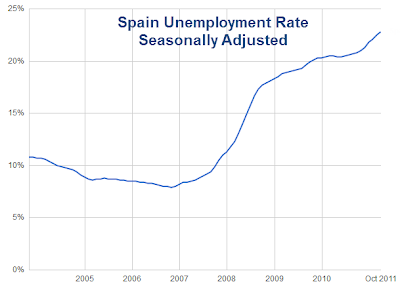 Austerity measures in Spain will force down home prices, force up the unemployment rate, and force up losses on Spanish banks. As I have noted before, Spain needs to restructure work rules, make it easier to fire people (which will eventually make it easier to hire people), get rid of government workers, lower taxes, and implement various reforms. Unfortunately, the Merkozy agreement demands many counterproductive austerity measures and tax hikes that will crucify Spain in the short-term. Banking losses will soar, GDP will plunge, and deficits will rise. The same setup applies to Portugal and Greece. Thus, the idea there will be no more sovereign debt losses will soon be smashed on the hard rocks of reality.